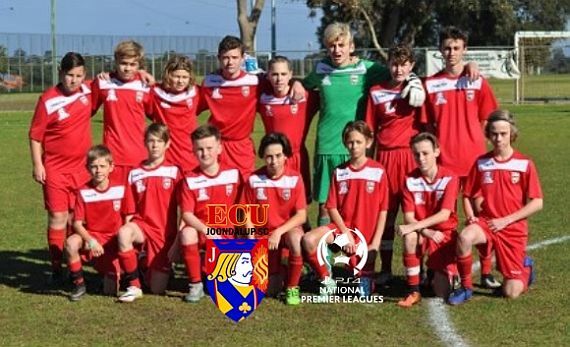 It’s a massive weekend of football for ECU Joondalup PS4 NPLWA sides with all sides taking part in the end of season Top Four Finals. The Jacks Under 12’s PS4NPLWA side won the Group B league title on the last day of the season on goal difference from Sorrento, with a 1-1 draw against Stirling Lions, and Coach Willie Kelly said the side have been fantastic this season, only losing three times in the league. It’s been a huge season for Nik Silsby’s side, they won the cup in a penalty shoot-out win against Perth Glory in the Cup Final at Wanneroo on the Saturday was followed by a 3-0 win on Sunday against Stirling Lions at Macedonia Park to win the league and Silsby said it’s been a fantastic season. “I’m really not bothered about results, although it’s nice for the boys to win titles and cups. At the start of the year they all said they wanted to win every competition we entered without compromising our style of football and so far they have achieved this. We now move onto the top 4 competition and then the Bunbury carnival. “The top 4 will provide the boys with something different as the losers in each game drop out but with the mental resolve they have I’m sure they will cope well. I just hope we continue playing good passing football and continue their development through to the end of the season.